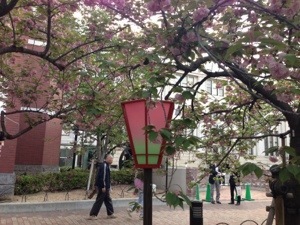 In a few posts before, I talked about Yae-Zakura (八重桜） which is double cherry blossoms and the event for Yaezakura viewing at Japan mint bureau (造幣局） in Osaka head office which is now officially opened to public from April 16th-22nd. Yesterday, I finally got a chance to go to the event. I choose to go on a weekday expecting that there will be zillions of people on the weekend. As soon as I got out of Temmabashi station (天満橋駅）, I could see sign saying ‘Cherry Blossom viewing’ (桜の通り抜け) with police shouting and pointing out the direction toward Japan Mint Bureau. 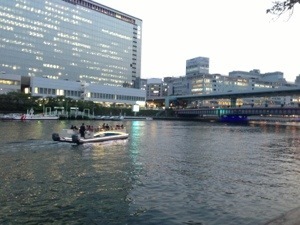 From the station, we walked across Ogawa river (大川）and turned right. 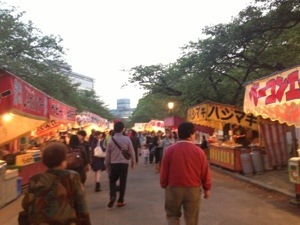 So many food stalls were all along two sides of the road making the place look like a festival. This one was still full of blossoms. 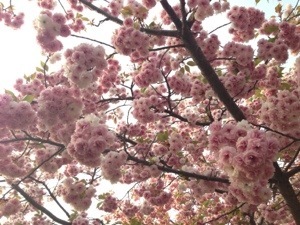 This type of sakura is just beautiful. 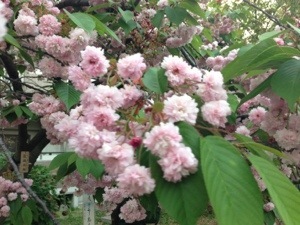 The blossoms look like little bouquets hanging on a tree. Apparently, even among Yae-zakura, there are so many types as well. Unfortunately, this year we could not see the green and yellow Yae-zakura which must have already fallen a couple of weeks ago. 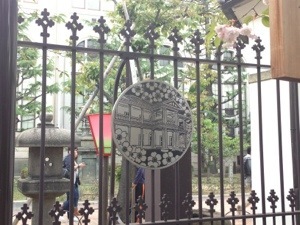 The area inside Japan mint is somewhat similar to what supposed to be a cherry blossom tunnel with coins and metallic objects factory along side. 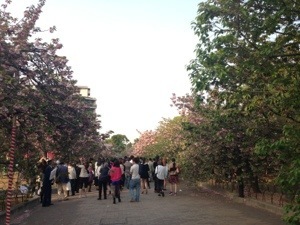 Most sakura trees started to have green leaves indicating that the blossoms are about to fall. Still, it is beautiful. But as we all know, sakura is short-lived. 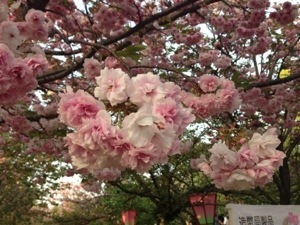 At night, all the sakura trees were lit up and the night sakura view is said to be enchanting. I did not stay till the light up this time. 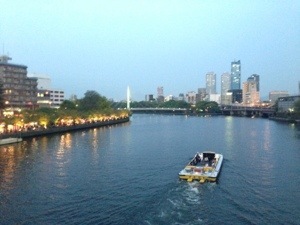 Then, I walked back to the station pass the beautiful Ogawa river. 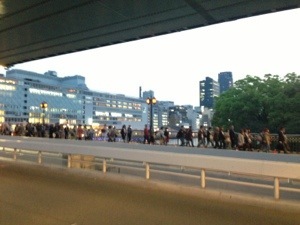 Across the street, a huge crowd of people who just finished working were marching down to Japan Mint bureau to see Yaezakura.